Clearing up some misconceptions about the "Hindu Trinity"
The three interesting-looking persons depicted here are Brahma, the world-creator, Vishnu, the world-maintainer, and Shiva, the world-destroyer. Perhaps you’ve heard them characterized in that very misleading cliché of introductory World Religions texts as “the Hindu trinity.” And perhaps you’re simply inclined to dismiss them as the fanciful projections of a primitive mythologizing imagination run riot. But, if you go to the proper sources, the venerable Vedic texts Bhagavad-gita and Srimad-Bhagavatam, you’ll find Brahma, Vishnu, and Shiva accurately explained in the context of an exacting and comprehensive account of God and His creation, an account that is unrivaled in completeness and coherence by any other philosophical, scientific, or religious literature, and that is not only intellectually satisfying but also aesthetically captivating and spiritually fulfilling. In Srimad-Bhagavatam you’ll encounter the important distinction between the idea of “God” and the idea of “Absolute Truth.” “God” refers to any powerful controller, while “absolute truth” designates the ultimate source of all energies. There can be many gods, many controlling departmental heads of universal affairs, but only one absolute truth. This absolute truth is ultimately a person— Krishna. From Krishna everything emanates; by Krishna everything is maintained; to Krishna everything returns at the time of dissolution. This is what is meant by “absolute truth.” Anything that exists is either Krishna or Krishna’s energy. Krishna’s main energies are three: His internal energy is manifest as the transcendent spiritual kingdom; His external energy, as the temporary material world. His marginal energy is comprised of all living creatures, the individual animate souls. Souls are “marginal” because they can dwell either in the spiritual kingdom, serving Krishna in bliss and knowledge, or in the material world, forgetting Krishna in darkness and suffering. The Sanskrit word for the soul is jiva (“living entity”), and the marginal energy is also called jiva-tattva, the category of the jiva. Not only does Krishna expand through His energies, but He also expands Himself personally, directly. Krishna’s direct, personal expansions are called vishnu-tattva, the category of Godhead. Like the persons of the trinity in Christian doctrine, the vishnu-tattva expansions are one, but because Krishna is unlimited, His personal expansions are not merely three but unlimited divine persons, all manifested to perform unlimited divine pastimes. One of Krishna’s pastimes is to emanate, sustain, and reabsorb the material creation in periodic cycles, and this Krishna does in the persons of Brahma, Vishnu, and Shiva, who are called guna- avataras. Material nature acts in three ways or modes (gunas). When there is creation—construction, generation, procreation, etc.—material nature acts in the mode of passion (rajo-guna). When there is sustenance—maintenance, preservation, endurance, etc.—nature is working in the mode of goodness (sattva-guna). When there is destruction—decay, dissolution, devastation, etc.—nature acts in the mode of ignorance (tamo-guna). Brahma is the controller of nature in the mode of passion; he is the engineer who creates the universe. Every universe has its Brahma, who appears as the first created being in it. Although Brahma is usually in the category of jiva, he is designated an avatara (incarnation) of Krishna because he is especially empowered with Krishna’s own creative potency. Using the ingredients furnished by Krishna and following Krishna’s blueprints, Brahma constructs the material universe, and then he begets the offspring, called Prajapatis, whose descendants populate all the planets. 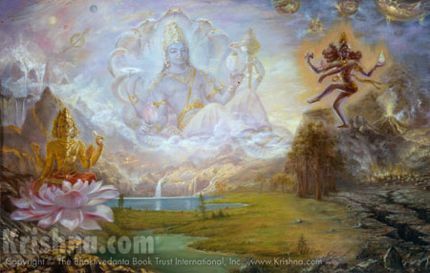 Vishnu, who controls nature in the mode of goodness and sustains the creation, is directly the Supreme Lord. In the spiritual kingdom of God, where everything is everlasting, the quality of goodness exists without either passion or ignorance. Therefore it is appropriate that Vishnu personally controls this quality even in the material world, where it becomes bracketed by ignorance and passion. Shiva, the lord of the mode of ignorance, devastates the universe at the end by his wild, all-annihilating dance. Shiva is a personal expansion of Krishna, not a jiva, yet because he comes into intimate contact with the quality of ignorance and with matter (which is innately ignorant), you cannot receive the same spiritual restoration by worshiping him that you do by worshiping Krishna or Vishnu. Shiva is therefore given his own category, shiva-tattva. Srimad-Bhagavatam ( 2.7.39) sums it up like this: “In the beginning of creation there are penance, myself [Brahma], and the Prajapatis, the great sages who generate; then, during the maintenance of the creation, there are Lord Vishnu, the demigods with controlling powers, and the kings of different planets. But at the end there is irreligion, and then Lord Shiva and the atheists full of anger, etc. All of them are manifestations of the energy of the supreme power, the Lord."